In Occupation Europe–Lou Satz tells it like it was during his year of duty with the U.S. Army of Occupation in post-WWII. Satz, a 19-year-old sergeant, was one of the first soldiers in the newly formed Constabulary Corps. This elite corps was thrown into the mass confusion of conquered Europe and assumed responsibility for policing more than 16 million men, women and children in Germany and Austria. They provided security to civilians, hunted black marketers and Nazis, assisted in rebuilding local governments, and provided border security. Satz reveals the personal side of his experiences, including a chance encounter with the famed Nazi hunter Simon Wiesenthal and his efforts to aid displaced persons. 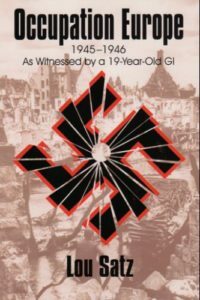 Satz also shares the experiences of some of his friends including a battle-hardened soldier who chose to remain in Austria and a young Austrian girl whose family had resisted the Nazis. Rarely has anything been written about this critical time in history. Satz fills in the blanks for us.